There is no doubt that Death in Vegas had a serious job on their hands with this album. "The Contino sessions" was so acclaimed and Richard Fearless and Tim Holmes's profiles as producers have gotten so high that they really had to come up with the good on this album. Openers 'Leather' and 'Girls' will not disappoint. The two are basically one long introduction track, the former a driving instrumental piece filled with synths, distorted guitars and powerful rhythms, which blends seamlessly into the more ethereal and uplifting 'Girls', constructed around a simple melody line on a guitar, with female vocalists going "ahh, ahh" that builds intensity as it goes along. 'Hands around my head' is in the electroclash vein of things, with vocals from one half of Adult, Nicola Kuperus, but it thankfully avoids the monotony of much of the style and creates a far more textured sound. '23 Lies', with Woodbine chanteuse Susan Dillane on vox, is very much an old 4AD ethereal type song, nice enough, but nothing compared to anything by the Cochteau Twins. In complete contrast, there's the title track featuring a certain Liam Gallagher (when his original front teeth were still intact). The track itself is a bright and easy-going little piece, but the shock, for all Oasis haters, is that he sounds bloody good. I don't think it's going too far to say that this is probably the best track he's ever been involved in. 'Killing smile' stays in a similar vein of brightness, a lovely little folky number with guitar, banjo and mandolin and a lush violin sound and some soft and beautiful vocals from Hope Sandoval. Then they change tack completely with the less than impressive dark ambient sound of 'Natja', and then there's another complete change for the brilliant 'So you say you lost your baby' with Paul Weller. This is virtually electronica free and the closest comparison is probably something by the Faces from back in the sixties. It's an upbeat track and a nice change from the overindulged dad rock stuff we hear from Weller these days. 'Driving horses' sees the return of Dot Allison, Richard Fearless' other half, for another heavily Cochteaus influenced track. Again, it's not bad, but... Hope Sandoval's back for the final track, 'Help yourself', a slow, lush atmospheric number with a strong psychedelic feel and loads of violins. It sounds very like something Lisa Germano would do. 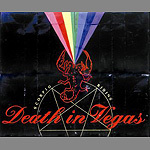 All in all, it's a varied, if somewhat patchy release, but there's no doubt the production abilities of Death in Vegas are among the best in the business. The biggest problem with this is that it's too varied, there's no real sense of who Death in Vegas are these days and few original ideas. It's brighter and more upbeat than "The Contino sessions", which was probably the idea, but there's so many different styles on show that the band's own identity is missing.